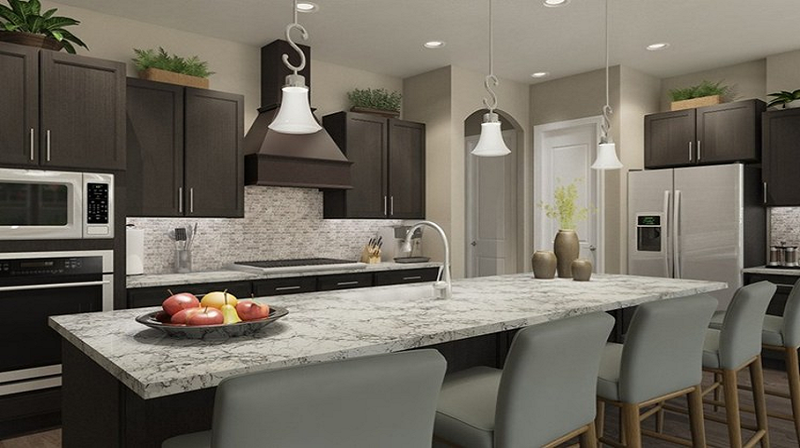 Marble countertops are a trendy yet elegant choice for your kitchen, as featured in floor plan Stonewood by Pulte Homes in Austin, TX. As a new homeowner, you know that the way the rooms in your house look and feel have a profound and lasting effect on the memories you create in your home. Designing your home is not just about manifesting your aesthetic vision, it’s about having a space that continually inspires you to be your best self. And a kitchen has so many possibilities. A great kitchen can set the stage for you to create the meals you’ve always wanted to make and share them with loved ones. A not-so-great kitchen only gets used for storage. The most important part of a kitchen is the countertop. It’s what you’ll be looking at the most (other than inside the fridge, of course). You do everything on a countertop—prepare your meals, look at recipes, open up your favorite bottle of wine. So, the material you pick for your countertops really matters. For your new home, you may want something that fits your lifestyle while still being trendy. Luckily, you have many interesting materials to choose from. We’ve compiled a list of the latest in countertop design and materials so you can create a kitchen that inspires you. When it comes to kitchen countertops, granite has been king for a long time. But in recent years, quartz has been steadily taking its place. Quartz’s appeal stems from its durability. It’s very low-maintenance and can withstand cracks, stains and more. It’s also pretty easy to clean. All you need is soap and water. A wood countertop is very flexible and can completely transform the look of your kitchen depending on what kind of wood you choose. You can have the coziness and comfort of a country kitchen, the boldness of a raw wood edge or the texture and trendiness of reclaimed wood. It’s up to you. Maintain your wood countertop with periodic sanding, staining and oiling. Marble is the statement countertop of the moment. And it’s such an elegant material, that people are starting to use it in other parts of their home. But all of that beauty comes with some drawbacks. Marble is expensive and because of its vulnerability to wine, juice and oil, it’s also very high-maintenance. Even if you get your marble countertop sealed professionally when you first install it, it can still be susceptible to damage. You will need to seal it twice a year to keep it in good shape. Marble is also a soft stone, so expect chips and scratches. You might not be able to get around the constant upkeep, but you don’t always have to pay top-dollar for marble. Carrara marble is one of the least expensive marbles you can get. Concrete may seem like an unconventional choice for a countertop, but it has become quite popular. #ConcreteCountertops has more than 23,000 posts on Instagram alone. Seal your concrete to prevent your concrete countertops from absorbing liquid and bacteria. Keep in mind that the material can crack and get scratched up, which is perfect if you’re one to embrace imperfections. But if you prefer that your kitchen countertop stay pristine, then concrete might not be the material for you. Minimalism has taken over kitchens and it’s easy to understand why. Sleek, clean lines are a simple way to make a statement. Plus, many minimalist kitchens prioritize and emphasize storage (it’s easy to keep a clutter-free kitchen when there’s a place for every little thing), making it a functional choice fit for everyday life. Minimalist countertops are not limited to a certain material. You can use any of the materials mentioned above to create a clean look. It depends on how you shape the material and design the countertop (think waterfall edges or one long, efficient worktop). Your countertops are the major focal point of your kitchen. They tend to set the tone of the space. It’s all about choosing a material that fits your vision and lifestyle. Whether you want something durable, cozy, elegant, industrial or simple, your new home is sure to stand out with any of these countertop choices. 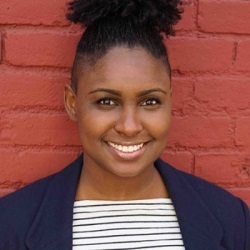 Danielle Small is a freelance writer and strategist with a few awards under her belt, including a 2016 Min Online's Editorial Award for Opinion/Commentary. She is a graduate of the New School in New York City, where she received a bachelor's degree in journalism. She has written for a variety of publications including Salon, Fast Company and more.